We still need many more letters to go to Rome, if you have not done so please do so now. If you would rather not send the PFJ a copy of the letter that you sent would you let us know that you have written we are trying to keep a count of how many letters are sent. Maybe the reflection on Bishop Dewane below will inspire you to write your letter. In November, 2015, Bishop Frank Dewane of the Diocese of Venice in Florida was elected by his brother bishops to be the Chair of the Committee on Domestic Justice and Human Development of the U.S. Conference of Catholic Bishops (USCCB). In the subsequent months, Bishop Dewane has been a vocal spokesman for his committee as attested to by the link to his activities at the USCCB website. Bishop Dewane has spoken out and issued letters and press releases on important issues that impact domestic justice and the welfare of human beings such as proposed legislation regarding health care, Congressional budgeting and appropriations that impact the working poor, environmental stewardship, and imposition of the death penalty in Arkansas and in Florida. He is to be commended for his efforts in making known the positions of the bishops on issues that relate to Catholic social teaching and that fall under the umbrella of his committee responsibilities. The Diocese of Venice has provided a link to Bishop Dewane’s July 25 radio show that focuses particularly on the death penalty, why Catholics should be against it, and what the faithful can do to end this injustice. It is important to consider what the bishop has said. Here we summarize some of the most salient parts of the full description. Bishop Dewane encourages people to be more attuned to what is happening in Florida and nationwide regarding the death penalty debate with the cruelty of executions, the fact that the death penalty does not reduce crimes, botched executions, fights over the medications used, and more people exonerated from death row each year. He says, “We do not want this license to kill to be used so freely as it has been in the past. We want it stopped. There is nothing restorative about killing the person.” Bishop Dewane pointed to the execution of four men in Arkansas by lethal injection as “an example which created unnecessary suffering. There was an outcry because there was something very wrong taking place.” He stated that the “death penalty is not humane at all. It is the taking of human life” and noted the need for punishment to be punitive and restorative. Bishop Dewane also commented that the example of an individual who was exonerated of crime while sitting on death row reinforces the flaws in the death penalty process. Bishop Dewane is correct. We are also sure that his defense of life means much more than merely allowing an individual the right to inhale and exhale. Life is more than this. Life provides opportunity to be drawn to the redemptive love of Jesus. The opportunity to experience this love is why people must live and not be summarily dispatched by a legal system. That would deny the restorative elements of punishment, punishment that might possibly have been meted out to one who was unjustly condemned. Humanity must have hope. The outcry of people because something very wrong was taking place in Arkansas was praised by the bishop. This outcry is an expression of the love of Jesus for all human beings, an expression of people that they have not abandoned hope. Bishop Dewane’s words of support are on target. Despite Bishop Dewane’s eloquent words in defense of human life in opposition to the death penalty, that eloquence is not always matched by his actions. In his own diocese, a scurrilous charge was made that one of the priests of the diocese, Fr. 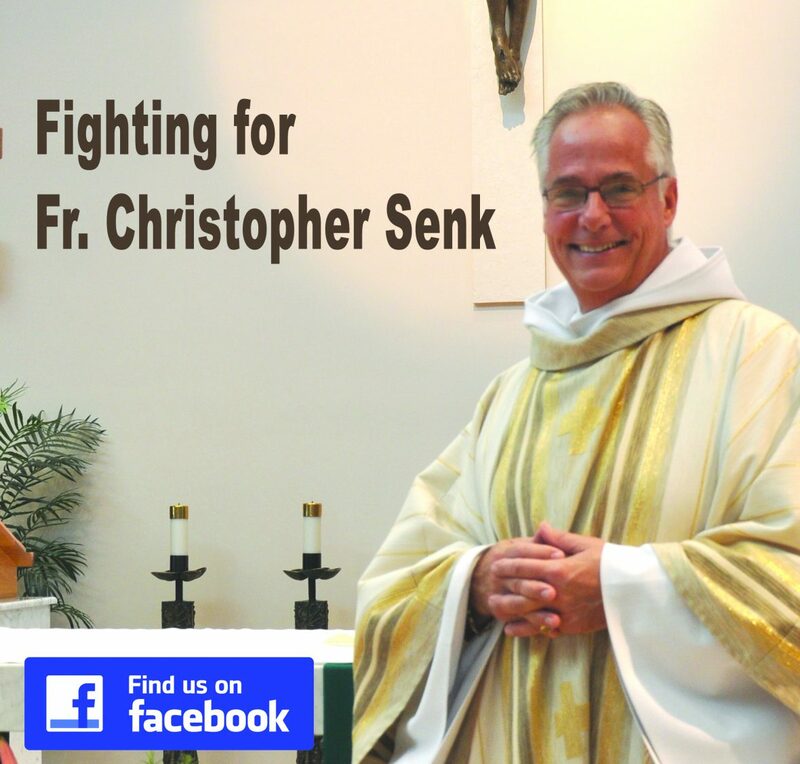 Christopher Senk the pastor of St. Isabel Church in Sanibel, had taken financial advantage of an elderly parishioner. The civil authorities investigated the charges, found no cause for prosecution, and declared Fr. Senk to be innocent. At that point, almost two years after the charges were made, the bishop placed Fr. Senk on administrative leave, declared that he would begin his own investigation, and declared that after completing his investigation he would send the case to the Vatican for the purpose of having Fr. Senk removed from the priesthood. In this case too, there has been an outcry from the people. Something very wrong is taking place. No. Fr. Senk’s physical life will not be snuffed out. He will be able to inhale and exhale. However, Bishop Frank Dewane is attempting to kill the vocation of a priest who has served the people and the church faithfully for 41 years. He wants to kill hope. He wants to push Fr. Senk away from the redemptive love of Jesus. Fr. Senk’s vocation has been placed on death row; Bishop Dewane is advocating for a lethal injection. How can a bishop not only advocate but also act for something that is totally punitive, that offers no hope of restoration, that creates unnecessary suffering for many? One could try to answer this last question, but that would be trying to read the heart of another human being. We can all imagine scenarios and project how we would act in those scenarios. But reality is different; events and situations with which we are actually presented elicit responses quite different from those we might have expected. Life is difficult; but it demands to be preserved, restored, and encouraged so that all might have hope, find love, and respond fully to the calls of Jesus in our lives. The quote from the first letter of John at the beginning of this reflection sets the standard. May Bishop Dewane embrace that standard in his dealings with Fr. Senk. May the people of God continue to cry out at the injustice inflicted on Fr. Senk and at all injustices, regardless of their source. May we act in our dealings with those for whom we are responsible in ways that are restorative, that offer hope, and that offer true life.